With FontViewOK can display, or use the windows fonts in other programs without install the font file. The font is just joined, when you restart the Windows, the font will be no longer displayed. After you select the font with the right mouse button, in context menu simply select the option "Register without install" (see Image-1). And already, the corresponding non-installed font can be used by other programs, if necessary the program must be started again This is in case for Excel, MS-Word or Other MS-Office Software (2012, 2016, 365). That's it! Please use the ... latest version of FontViewOK! Image-1: View and use the fonts without installing the font file! 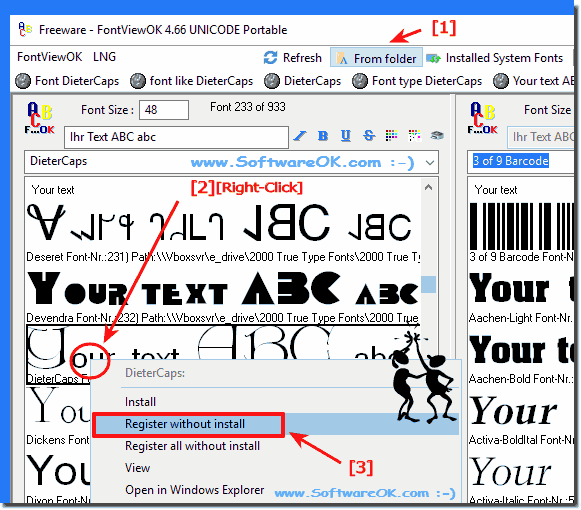 FontViewOK - FAQ-2: How to view and use the fonts without installing the windows font file? Use a purchased font without installing it? How to use the fonts without install? Windows 7 use font without installing? Can i use a font without installing it? How to view fonts without install? Preview font without installing free? Can you use dafont fonts without installing them? How to install ttf file on a computer without installing it? How to use a font without installing it?